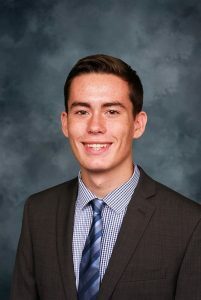 Nathan Ruplinger is an upcoming junior at Drake University, double majoring in actuarial science and finance, with a minor in data analytics and a concentration in insurance. Although he has spent most of his life living in Wisconsin, Nathan has loved his time spent in Iowa and is unbelievably grateful to be the recipient of such a prestigious honor. At Drake, Nathan serves as President of Residence Hall Association, the second largest organization on campus. He is also a member of the professional business fraternity Alpha Kappa Psi, where he has held a multitude of leadership positions. Additionally, Nathan works in the Office of Admissions as a Student Ambassador, helping prospective students choose the school that is best for them. This summer, Nathan will be working for SCOR Global Life Americas in Kansas City as an Actuarial Intern. He is excited to learn more about reinsurance, study for a couple of actuarial exams, and explore a new city. If you have any questions, comments, or just want to chat with Nathan, feel free to connect with him on LinkedIn.